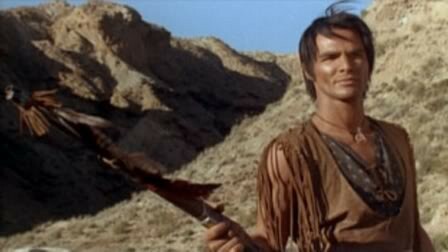 Heep big Indian brave Burt Reynolds in Navajo Joe (1966). In the essay "Hamlet and His Problems," T.S. Eliot famously declared Coriolanus to be Shakespeare's greatest play. I'm not about to wade into that swamp (David Haglund has already led the charge with an interesting piece in Slate), but there's no question that Coriolanus is a thorny, brilliant drama with plenty to tell us about the friction between democracy and military might. Ralph Fiennes's new movie adaptation, the subject of this week's long review, opens Friday at Landmark's Century Centre. Also in this week's issue, Ben Sachs recommends Doc Films's screening on Sunday of My Childhood (1972) and My Ain Folk (1973), the first two parts of Bill Douglas's autobiographical trilogy about growing up in a Scottish mining town. And we have new reviews of The Innkeepers, a New England ghost story from horror up-and-comer Ti West (who appears at the Music Box for the 7:20 PM show, part of a double feature with his The House of the Devil); My Piece of the Pie, a social satire by French writer-director Cedric Klapisch (When the Cat's Away); Navajo Joe, a 1966 spaghetti western starring Burt Reynolds (yes, I'm afraid he does play the title character); Untamed, a 1957 drama by Mikio Naruse (When a Woman Ascends the Stairs), screening as part of Doc's ongoing Monday-night series on Naruse and actress Hideko Takamine; Windfall, an eye-opening documentary about a New York town divided by the prospect of industrial wind turbines being erected on local farmland; and The Woman in Black, with Daniel Radcliffe as a Victorian lawyer haunted by the title spirit. Best bets for repertory: Rowland Brown's Blood Money (1933), Saturday afternoon at Northwestern University Block Museum of Art; Dennis Hopper's rarely screened The Last Movie (1971), Friday night at Block; Robert Bresson's A Man Escaped (1942), Saturday through Monday, and Mouchette (1966), Sunday and Monday, at Gene Siskel Film Center; Bela Tarr's The Man From London (2007), Friday and Tuesday at Film Center; Marjane Satrapi and Vincent Paronnaud's Persepolis (2007), Billy Wilder's The Private Life of Sherlock Holmes (1970), Wednesday at the Portage, presented by the Northwest Chicago Film Society; Wes Anderson's The Royal Tenenbaums (2001), Friday at Doc; and John Huston's The Treasure of the Sierra Madre (1948), Wednesday at Doc.